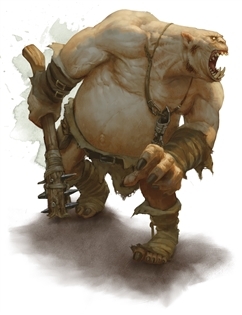 Ogres are hulking giants notorious for their quick tempers. When its rage is incited, an ogre lashes out in a frustrated tantrum until it runs out of objects or creatures to smash. WHAT ARRR YA DOOEN IN MA SWAMP!? Why is this page meme ridden? Does anyone know what the driving force behind making large humanoids only have 5 ft reach? It feels like a significant downgrade in their threat. Always free to give them a reach weapon if you want to. I'm running a campaign and so i decided to put a green ogre in a swamp and the first things the players hear when they enter the swamp is "WHAT ARE YOU DOING IN MY SWAMP"
WHAD YA DOIN' IN ME SWAMB!! !